The Force Awakens Invades Jimmy Kimmel Live! Star Wars: The Force Awakens invades Jimmy Kimmel Live! -Except for some minor color corrections and last-minute technical tweaks, the film is done. -Only a few select friends and family members of J.J. Abrams have seen the movie. There you have it. Not much in the way of spoilers, but this is J.J. “Mystery Box” Abrams we’re talking about, and the cast have already said there are contractual financial penalties if they reveal any specific details about the movie. 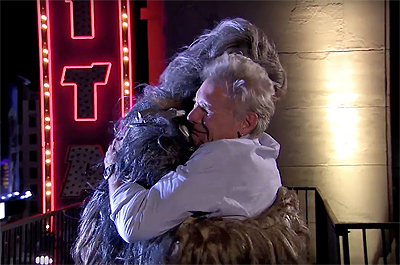 However, we still encourage you to watch some of the fun clips below, which includes a reconciliation between Harrison Ford and Chewbacca after their last tense appearance on the show. There’s also cast members Adam Driver, Daisy Ridley, John Boyega and Carrie Fisher, the latter of whom whispers the ending of the movie in Jimmy’s ear.